Why is footwork so important? How's it going guys, I'm Danny. 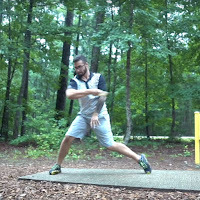 If you don't know me, I make weekly videos on YouTube covering disc golf form. 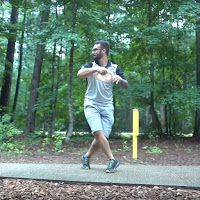 I do side by side comparisons, beginner mistakes, or sometimes breaking down the mechanics of what's supposed to happen when in the throw. This is my first time writing for the blog and it's a little weird. Usually I just set up the camera and ramble for a bit, but here I can really break it down. So we'll see how this goes, my first topic is footwork! I have done, at this point, hundreds of form critiques and the most common issue I see is footwork. This is also the first step to gaining a powerful and consistent shot. Correct footwork sets up a balanced, powerful position that allows the thrower to throw a consistent shot and avoid injury. It's also super easy to fix. Just knowing what's supposed to happen and what to avoid makes a huge difference. So here we go! Let's break down some footwork. The first thing I always look at in footwork is the x-step. Almost everybody knows they should be using an x-step, but they have no idea what it's for. I get it, it looks cool and complicated, but for most people, it's just throwing them off balance. 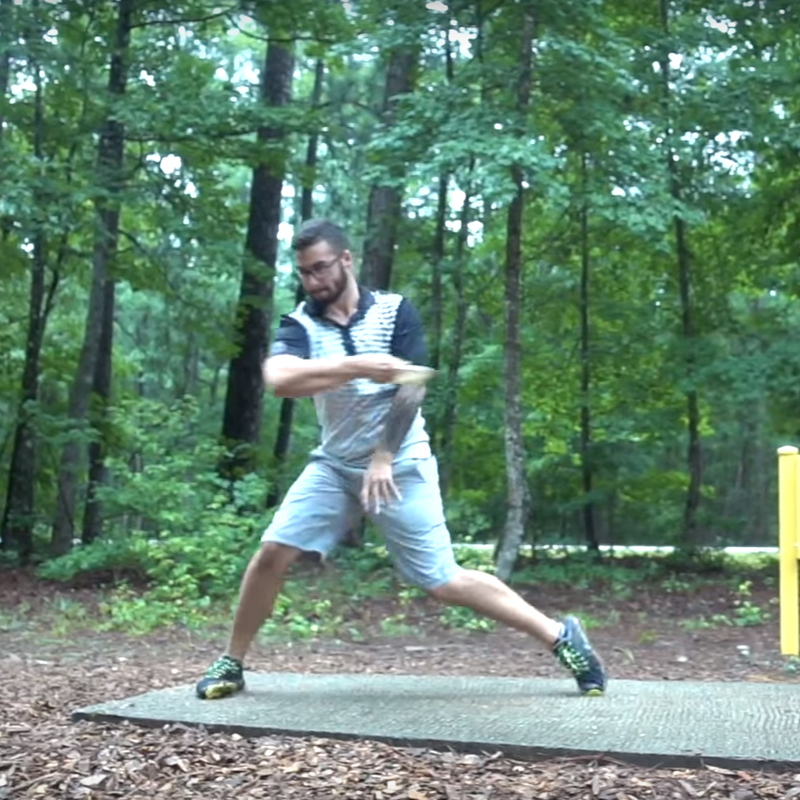 Most people turn around backwards in their x-step by turning their feet away from the target. The problem here is it forces the heel to carry the weight, and it points the hips away from the target. This throws off balance and hurts accuracy. The purpose of an x-step is to force the toes to carry the weight, and set up a good weight shift. To do this, you've got to keep your feet sideways. Make your x-step small, not more than about 6-12 inches from toe to toe. It's almost more of a shuffle than a step. Keeping your feet sideways will keep your hips pointed at the target and keeping it small will force you to shift your weight over your toes. Often times, just fixing the x-step will fix other problems in the throw too! The next step after the x-step is the brace. So coming out of the x-step, the tendency is to reach really far back and lean over your back foot. Then, the front foot comes down on the heel, pointed slightly towards the target. This means the spine is bending, all of the weight is coming crashing down onto the knee, and because the feet are orientated wrong, there's no range of motion for the hips. So, to brace correctly, keep the weight over the left foot as you bring your right foot forward, turn your foot slightly away from the target, and plant it on the toe offset about 6” to the left. Keeping your weight over your left foot means you're not going to lean back, turning the foot away from the target means you're setting up a closed stance so the hips have range of motion, and offsetting the foot to the left means your weight can shift into your front foot rather than crashing down onto it. Getting this step correct means less wear and tear on joints and a lot more effortless power. Arguably, the entire purpose of footwork is weight shift. Shifting your weight from the left foot onto the right generates a lot of energy. Using that energy to drive your hips and move up your body into the shot adds a serious amount of power effortlessly. So here's what a good weight shift looks like (see photo). At the peak of the reachback, the spine is vertical (not leaned back) and the left leg is carrying all of the weight. Then as you throw, if your weight is over your left toe, it'll shift onto your right, driving your heel down and turning it. Done correctly, you won't have any extra momentum from the weight shift left to follow through onto your left foot again. This sounds super easy, but it's one of the most difficult concepts to explain. The good thing is, if you set it up correctly with the x-step and the brace, everything else should just fall into place. I saw a video the other day that said it helps to turn your hips away from the target during the "brace" to get more power into the throw. They called it the "power load" position. I found I got some more distance doing that. 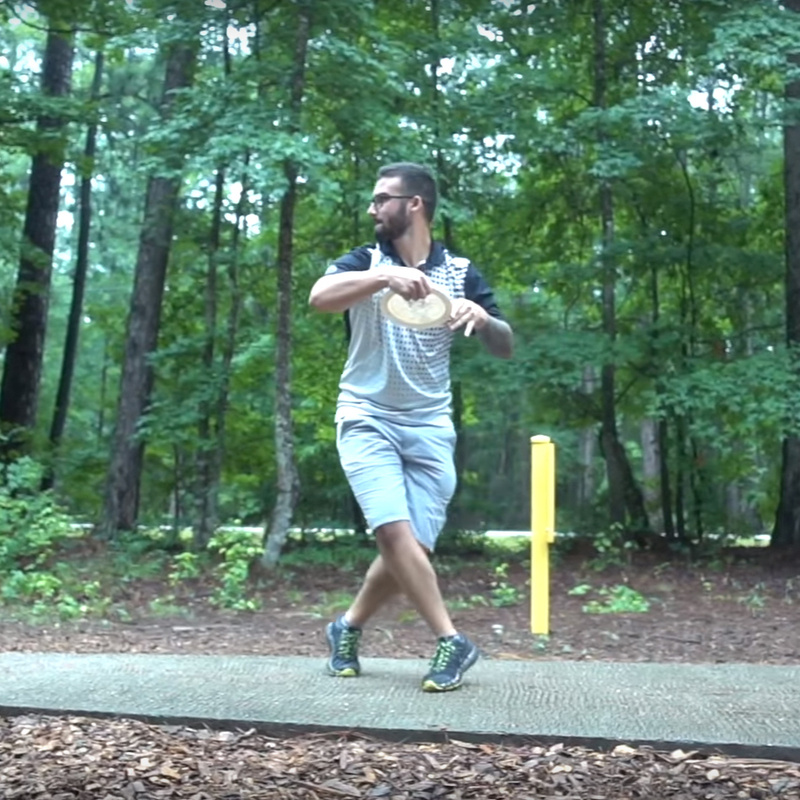 Does turning the hips away really hurt a throw overall? What's up bro! First, congrats on being a part of this blog! Excellent job! Thanks for the insight on footwork. It will help me gain the consistency i need right now. DD has a real gem in you. Wish you great success!